I was inspired by this post, but I’ve modified it. Instead of making the jeans completely in to a skirt, I’ve left them closed. Instead of ruffles, I just used a full length adult skirt. Mainly because I was too lazy didn’t have the heart to cut it up more. Next time, I’ll use fabric that matches the detail on the shorts more and cut the fabrics with pinking shears. 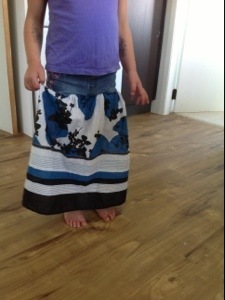 All in all not a bad way to repurpose old clothes in ten minutes flat.